Develop strong, yet flexible, horse hooves. Topical salve is protein-enriched to moisturize the entire hoof area. Reduces dry and brittle coronary bands, walls, frogs, and soles. 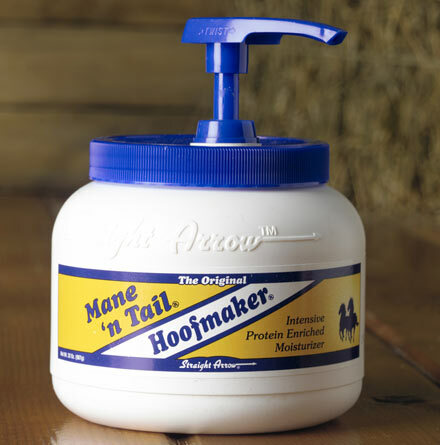 Helps repair external hoof damage. Contains no pine tar, petroleum oil, or turpentine, which dry out hooves and increase the chance of breakage or injury. Non-greasy formula is easy to use. Simply apply by hand and massage into hoof with fingertips. Use daily or as recommended by your veterinarian or farrier. Convenient 32 ounce pump bottle. Apply by hand, covering the entire hoof surface including coronary band, walls, frog and sole. Massage in with fingertips, leaving a thin, even film to absorb into the hoof. Apply daily or as recommended by your veterinarian or farrier. Water, Stearamidopropyl Dimethylamine Lactate, Distearyldimonium Chloride, Cetearyl Alcohol, Polysorbate 60, PEG-150 Stearate, Steareth 20, Cetyl Alcohol, STEARYL alcohol, Glycerine, Coconut Oil, Sodium Chloride, Vegetable Oil, Fragrance, Methylparaben, Propylparaben, DMDM Hydantoin, Phenoxyethanol, Protein, Lanolin, PEG-25 Castor Oil, Allantoin, Isopropyl Alcohol, FD &C Yellow #5, FD & C Yellow #6. Store in a cool, dry location. Do not allow to freeze. Keep out of the reach of children, pets, and animals. Not for internal use. Keep out of eyes and mucous membranes.